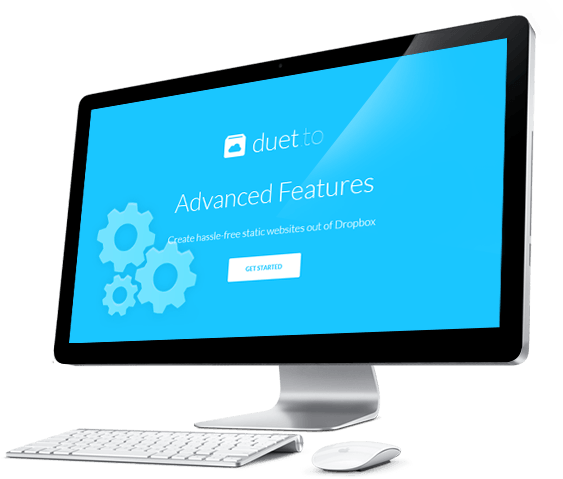 duet.to supports custom domains like www.mysite.com to be used for duet.to sites. You may purchase a new domain name or use an existing one you already own. Just follow the below steps carefully. Open your domain registrar admin interface and navigate to DNS management. Create (or modify) a CNAME record with hostname www to domains.duet.to, this will point the domain to your duet.to site. If concerned about TTL you can set it to 3600. It might take up to one hour for this change to take effect depending on your ISP. If your domain registrar supports domain forwarding, forward your main domain to the www hostname. For instance, if your domain is mysite.com forward it to www.mysite.com to make sure your main domain also works. Visit your site a bit later and make it a beauty. To avoid repeating content blocks like navigation menu and footer use the following duet.to tag to include HTML from another file like myfile.html for example. duet.to supports GitHub flavored Markdown and provides two ways of implementation based on your preferred style. To parse Markdown syntax, wrap your markup with the follwoing duet.to tags in any HTML page. duet.to parses all files with .md extension as Markdown. HTML tags in .md files also work as expected. In such a case, you need to dynamically output date related content, use the following duet.to tags. duet.to makes it really easy to capture form submissions and have it delivered to your verified email address, that is associated with your Dropbox account. Have a look at the sample form below. Make sure to have a field named email (you'll need it to respond). You can add more fields and style the form as you want. You can dynamically generate basic HTML tables by simply referencing Microsoft Excel files or Google Sheets published documents. Place your .xls file in the same folder where your HTML file is located and use the following duet.to tag, please make sure to save the file as .xls (Excel 97-2003 Workbook) as the new Excel format (.xlsx) is not yet supported. Create a Google Sheets document then select 'Publish to the web' from 'File' menu, click 'Publish' then copy the document key (the weird part only) and use the duet.to tag like blow. duet.to allows you to password protect your site so that only users with passwords can access it. Simply create a protected.txt file and add it to your site main folder with the following two lines. duet.to allows you to design your own 404 or Page Not Found error message. Simply create a 404.html page and add it to your site main folder.